What do sheep, cocktails and love triangles have in common? According to the minds at Atlus, it would be the genre-smashing adventure/puzzler/platformer Catherine. What exactly that means is difficult to explain to somebody not actually experiencing this absolute gem of originality and insanity. Vincent Brooks is a 32-year-old guy with a stable job as a software engineer, a reliable group of friends whom he shares drinks with and an attractive girlfriend named Katherine. He admits his life is simple and enjoys the predictability of it all. But when Katherine begins to stress the need for Vincent to grow up and commit to their life together, he embarks on an evening of heavy drinking as he reflects upon his new prospects. When he awakens the next morning, he opens his eyes to his shock to find the gorgeous, young Catherine sleeping next to him. His confusion become lies of deception, his deception fueling the fires of both women and nothing seems to keep his new sheep-filled nightmares from ever stopping. The first thing that instantly drew me to Catherine in the first place (the game, not the girl) is that Atlus tapped the same fantastic team that had been driving their Persona spin-off series. The development team had garnered a reputation for highly stylistic character designs with great anime styled cinematic sequences. 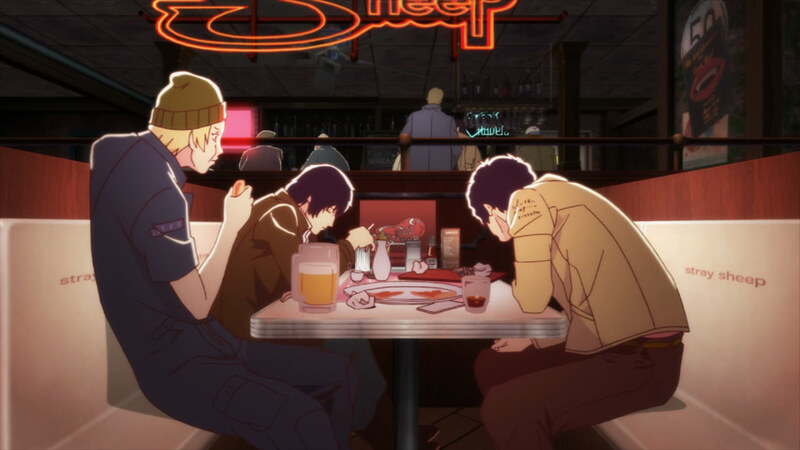 These character designs translated well to the daytime sequences in Catherine which primarily take place in the bar Vincent and his friends hang out, The Stray Sheep. At the Sheep, Vincent can interact with his friends as he learns about their stories, learn about the history of various drinks, as well as have conversations with other bar patrons and the staff. These interactions however are more than just meaningless conversations with strangers, but have recourse throughout the entire game. The fates of others at The Stray Sheep are hinged upon the advice that Vincent gives, or can’t give as some patrons are only available to talk to during a brief window. But where the story is primarily told through the bar and during animated sequences with Vincent, Katherine and Catherine, the real craziness happens when Vincent falls asleep for the evening. His nightmares are of himself, transformed into a sheep version of himself, climbing a complex tower of blocks, racing other sheep to the top. To top it off, his fears of the real world bleed over into his dream world as he flees from demonic visions of Katherine in a wedding veil and a young baby. 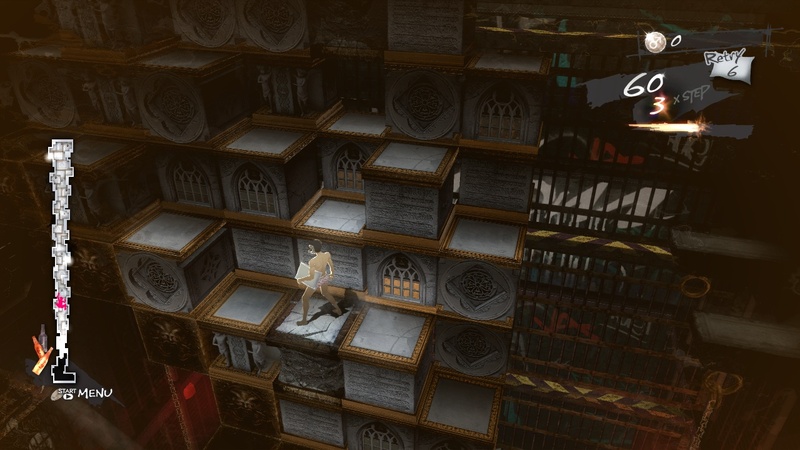 These climbing sequences are flat out difficult as they require not only clever strategy and manipulation of the block pieces according to the game’s rules, but speed as there is always a constant threat of the blocks below crumbling beneath Vincent’s feet or his nightmarish visions catching up to him. 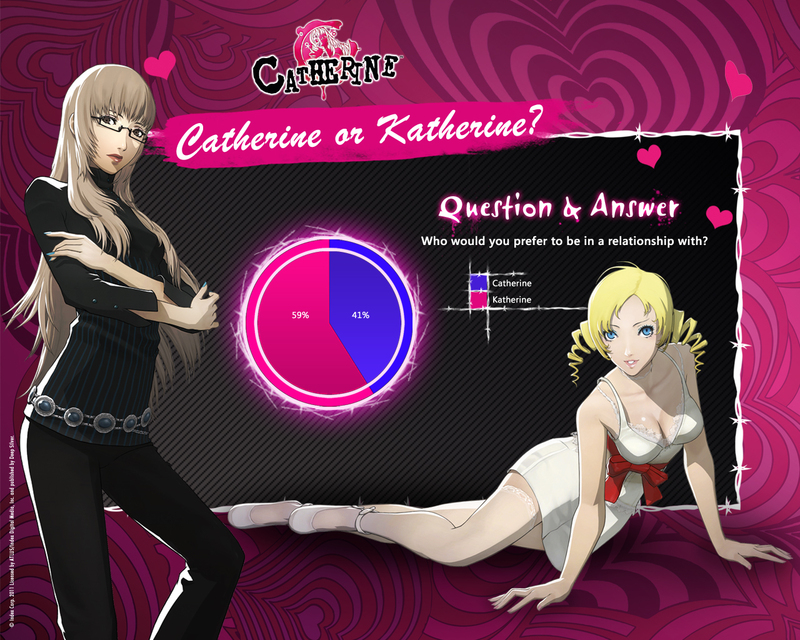 Catherine also poses a social survey when Vincent ascends levels. Questions include the likes of whether life ends or begins with marriage or which girl do you identify with. There is no moral right or wrong but results of these surveys are displayed during these quizzes to show you how you fit into society’s (or at least the online world’s) responses. Making your head spin further is the inquisitor will meet each answer with a condescending remark, as if he knows what is in store for Vincent. At the point of the game that I am currently trapped in is the tipping point where it appears that Vincent is fleeing from the responsibilities of his life with Katherine and is confused and frightened by the unknown turmoil that Catherine represents. Already patrons from The Stray Sheep have gone missing and I realize that my chances of receiving a perfect ending are unlikely. But plod forward I must, especially with such interesting characters as the central trio. Catherine is an interesting story with a ton of twists and turns, a brutally challenging puzzle platformer, a bit of relationship simulating and even a magnifying glass on society’s views on relationships. It is a bold attempt at an original work that certainly deserves to be completed for its unique stylings alone. This entry was posted in Gaming Backlog, Video Games and tagged Catherine, Gaming Backlog. Bookmark the permalink.